tThis is a site,dedicated to the genius of the wonderful,unique David Bowie.If you'd like to contact me with fan contributions,or if you own some concert photos of him that you made in the greatest night of your life,or if you just want to send your comments on this site,feel free to contact me here.The text which follows is a translation of a report/essay I made for a Bulgarian musical programme of the BBC radio. David Bowie is called 'the chameleon of rock music' and everyone,who is at least a little bit acquainted with Bowie's creative work,knows why.There's hardly a style in which he hasn't expressed himself.From glam rock to dance and jive,from soul and blues to techno and jungle,from tango and waltz(Rubber Band And Little Bombardier) to new wave,funk and ambient,for more than 30 years the chameleon is constantly changing his colour.His stage reincarnations are just as numerous-the transsexually looking alien Ziggy Stardust,the not any less strange with the red-and-blue lightning bolt through his face Aladdin Sane,the cocaine-addicted Thin White Duke,Major Tom and many others.Exactly this unwillingness to settle in one style attracts more and more fans of his,and I think it wouldn't be exaggerated to claim they're used to expecting the unexpected from him.Therefore the news for co-operation with Puff Daddy probably failed to surprise any of David's confirmed fans.Rap seems to be one of the very few styles in which his ever-searching for challenges spirit hasn't found expression yet. Music,however,is not the only occupation of Bowie.There's hardly anyone who,as a child,hasn't been enchanted by Jareth,the Goblin King in Jim Henson's magical tale 'Labyrinth'.In the cinema,as in music,Bowie surprises with his outstanding reincarnations.Besides the Goblin King he's been also an alien,destroyed by human vices in 'The Man Who Fell To Earth',a calculating businessman in 'Absolute Beginners',an immortal vampire in 'The Hunger',a young veteran of World War 1 in 'Just A Gigolo',Andy Warhol in 'Basquiat',a cold-blooded gangster in 'Everybody Loves Sunshine'-again these are only some of his roles,because it's imposibble that his whole career can be covered in a few minutes-career,in which he has also made his mark as a produser,helping such talents as Iggy Pop,Lou Reed and Placebo,an author of soundtracks,a painter,a mime and,as the Bulgarian magazine 'High Club' calls him-'an Internet guru' with his own provider(BowieNet) and an extremely interesting and well maintained site(www.davidbowie.com). 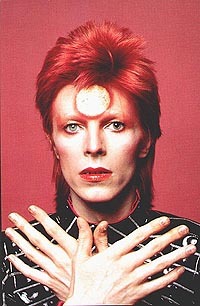 The fans of Ziggy Stardust probably are already awaiting with great impatience the 'Ziggy 2002' project,with which the rock legend intends to breathe new life into the space messiah.Meanwhile Bowie is also working on a new album in an ambient style,after Toy's coming out was postponed because of problems of his record company.Apart from that he's going to appear in three films.In two of them-'Zoolander' and 'The Mayor Of Sunset Strip' he's going to play himself and in the third one-'Dracula' for the Italian TV RAI 1 he's going to reincarnate into the famous vampire.The role of his opponent Prof Van Helsing will be played by the famous actor Jancarlo Gianini. That's in short.Whoever wants to get acquainted with David Bowie's life and creative work in detail,they should get one of the over 40 biographies dedicated to him,which,however,can possibly be found only in the catalogue of some of the big chains of bookshops,because,alas,none of them has been translated in Bulgarian.Which is really a shame,because David Bowie is one of the most talanted and interesting artists,both of the past and the new centuries.